My first challenge as a certified yoga teacher was to teach a class of children, girls from the ages of 6 to 11 at my local community center last fall. I’ve never taught children’s yoga and I certainly had expectations of how the class would go and what they would learn. What actually happened was very different, which reminded me of one of the core yogic principles of “letting go of expectations, and simply observing”. As any schoolteacher will tell you, attention span is one of the biggest stumbling blocks when it comes to helping kids learn and retain information. Before I began, I was certain that I could keep the group focused for 30 minutes at a stretch, just learning the plain old postures, before having to resort to making it fun or using other teacherly tactics. Depending on the day, I could hold their attention from 5 minutes to 20 minutes max. So I found the only way to keep the class moving and learning at a steady pace was to break down the hour-long class into 20 minute segments, by mixing and matching from activities that I created or adapted from other teachers. But no matter what activities I chose from, I always structured the class in a traditional format from beginning with OM, to sun salutations, standing postures, inversions, seated postures that included twist, corpse pose and on to a final chant to close the class. While I overestimated attention span, I underestimated their ability to hold and morph into postures themselves. Sure I thought, kids must be so much more flexible and sometimes stronger than us adults, but the girls could do almost all the poses immediately, almost perfectly with no hesitation whatsoever except for balancing postures. The fear factor that most adults display when the words split, headstand, or handstand are uttered, simply wasn’t there for the kids. They would whip into the pose despite my cautions to move with care. Their challenge was remembering how to string the poses together for the sun salutation or surya namaskara, and doing all balancing poses, even poses that aren’t difficult for most beginning adult practitioners. They always wanted to jump ahead to more advanced poses that I preferred not to teach to avoid injury including kicking the teacher in the head!! Here’s what I found worked the best and the games I used to keep the class fun and stimulating. Beginning and Ending Yoga Practice – For me, yoga asana practice isn’t a true practice unless OM is included somewhere in the practice and we talked very briefly about the meaning of OM and why we chant together before starting the asanas. But in the beginning I just simply chanted it and had the girls chime in. Naturally, there were giggles and smiles, but I noticed that it certainly created energy and the sentiment of joy in the room almost immediately. At the end of class, I would usually close with song or with om shanti to leave the practice with a more peaceful vibe that wasn’t there at the beginning, no giggling! Kids love to sing, so opening the class with a call-and-repeat chant is a fun way to start, and there are so many to choose from. Ahisma or Non-Harming – We talked a lot about one of the core principles of yoga, Ahisma or Non-harming. Each class, I found simple ways to weave the topic of ahimsa into the class, whether we were talking about safety points, like not kicking or hitting other classmates (on purpose or by accident) and not hurting your own body by over-doing it with poses that you might not be ready for. I taught the students that ahimsa also applied to their words, to speak with kindness to each other and listen carefully to the yoga teacher so she wouldn’t loose her voice (ahh-hum). Breaking it Down for Them– Most kids have issues with attention span and let’s face it, a one-hour class can be a lot even when you’re having a good time. Breaking the class down into “digestible” pieces or activities below, but still teaching the classical forms and vinyasa made the class manageable for me and for the students. 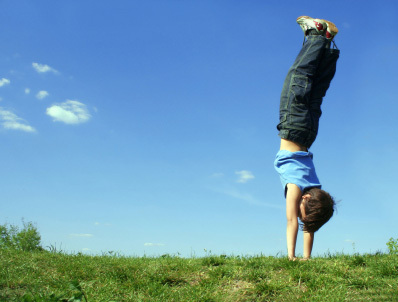 Balancing Clinic – Kids need to work on balance, it’s a developmental skill. I started this after the third class, focusing 10 to 20 minutes on balancing poses including lunge, tree pose, three-legged downward dog, and crow pose which quickly became one of their favorites. I built a quick flowing routine mainly out of balancing poses to have the girls quickly shifting, to improve strength and balance. Downward Dog Tunnel – This can be a fun change of pace for a long yoga session when boredom starts to set in. It’s also a fun way to segue in between teaching sun salutations and other challenging poses. However, if my class happened to be very full, I would usually choose one of the other “games” since a very large downward dog tunnel can be fatiguing for the students to hold and avoiding injury is one of the things the teacher should be really attentive towards. To set up the tunnel, have your students line up in downward dog pose, hip to hip. Have the student at the beginning of the tunnel to crawl through and take their downward dog at the end of the tunnel. Name that Yoga Pose – I created this silly “duck, duck, goose” of sort game, sitting in a circle with the girls and we clapped our hands in rhythm. I called out in a sing song voice “name that yoga pose and do it”. Next, I would shout out one of the many poses I had taught them and each would take their turn, stand up quickly and demonstrate the pose. This is a great game, especially for students who tend to run around the room while others follow in the sun salutations. It can also be a wonderful review of the names and body alignments for new poses. Wiggly Worm – I learned this move from my friend and yoga teacher Suzanne Ausnit. This is a great workout for the obliques and a safe stretch for the lower back. Lay a blanket on a floor that is not carpeted, say hardwood, stone, or linoleum. Lay on your back on the blanket. Move your hips from side to side, bringing your hipbone towards you rib cage on one side and then switching to the opposite side. For the more challenging version, lift the legs and bend the knees. Touch the toes together and let the knees fall out to the sides. Repeat the same, side-to-side motion as in the first version of the pose. Looking for music to play in your children’s yoga class? Here are my top picks. Under a Shady Tree and Rocketship Run by Laurie Berkner, Let’s Go by Susie Tallman, and Dreamland with various artists. 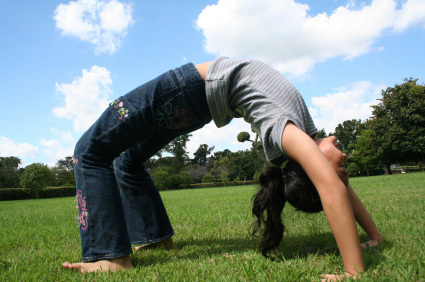 Learn more about how kids can get real benefits for yoga from yoga journal. Great post! Thanks for sharing useful information. I’ve been teaching yoga to children for about ten years and I really liked your down dog tunnel idea. Great! I also use music quite a lot.